Conscience decides he cannot allow Master Mold to destroy billions of humans in his quest to destroy every mutant with the Retribution Virus. 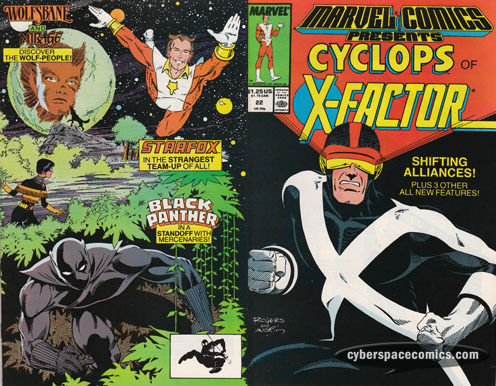 So, the villain strikes an uneasy alliance with Moira MacTaggert, Callisto and the depowered Cyclops. The wounded Black Panther fights through a strike force of South American soldiers. His fight inspires the local villagers to rise up against the militia that has invaded their home. Wolfsbane and Mirage journey to Muir Island on their summer vacation from Xavier’s School From Gifted Youngsters. Playfully, Wolfsbane runs off into the woods to chase a wolf – she quickly becomes lost but is found by a stranger who welcomes her to Avalon and bids her to join in the Midsummer Celebration. Rahne discovers a local village made of the Tuatha de Danan – the Children of Danu – all wolf shape-changers! The village hopes that Wolfsbane will add new, young wolf blood to their family – allowing it to continue with a new generation. But, when decides not to stay, will her new-found friends let her leave? Cruising through space, Starfox‘s ship discovers another spaceship that has jumped into their area of the vast void known as outer space. He and his gal-pal, Heater Delight, go out to investigate the new vehicle and its inhabitants. In the foreign ship, they meet Aalbort the Aakon trader who is still in battle with the ship’s invaders – alien warriors with energy swords. Their leader, Azunbulxibar, demands that Starfox, Aalbort and Heater surrender! When it becomes quite clear that our hero is physically outmatched, he’ll have to rely on his wits to save the day.